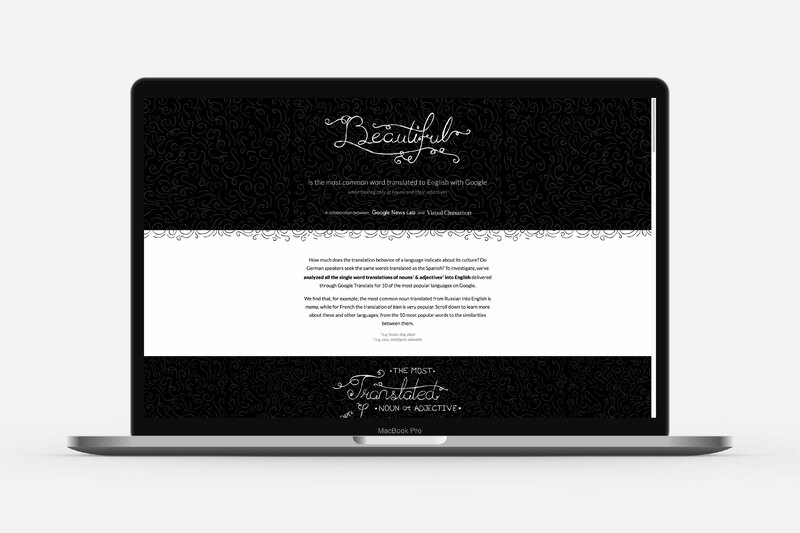 Beautiful in English let’s the viewer dive into the most popular words translated into English through Google Translate. It focuses specifically on nouns and adjectives. From the most translated word being beautiful, to the most translated word per language, the top 10 per language and finally the similarities between all languages. 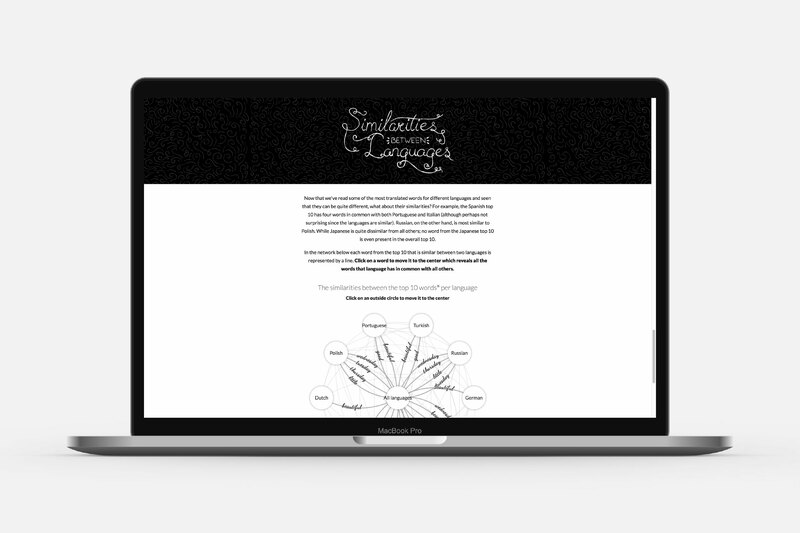 See which languages seem related through the words they both translate. But also how culture defines unique words, such a gentleman for the French. 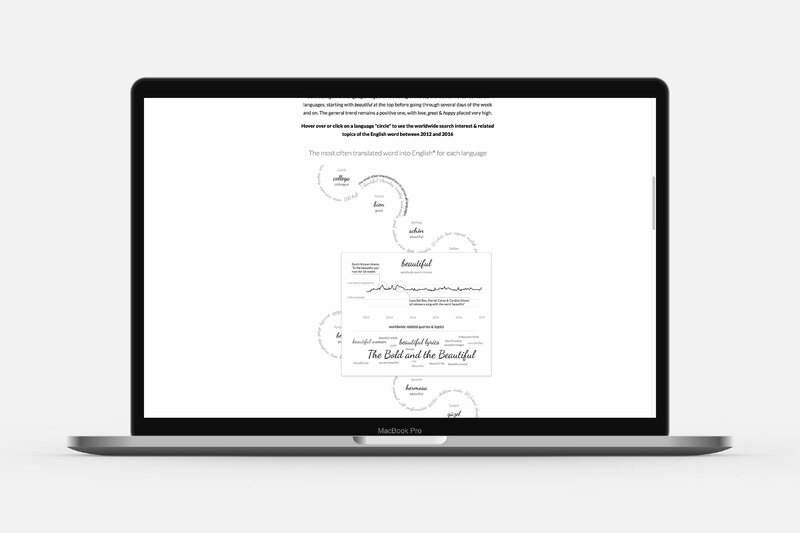 “Beautiful in English” won Bronze in the Design category of the 2018 Malofiej awards for best data visualization / infographics published in print and on-line across the globe. 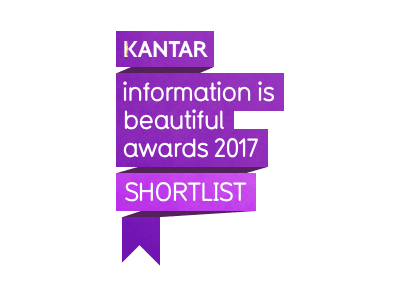 “Beautiful in English” was shortlisted in the People, Language & Identity category of 2017’s Kantar Information is Beautiful awards. 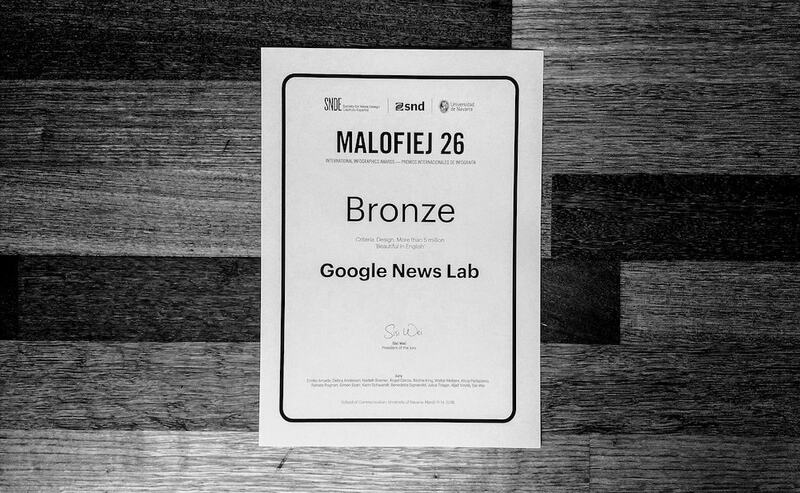 This collaboration with Google News Lab gave great creative freedom, as long as it was based on Google’s data. Within the scope of culture and being a non-native English speaker, I was very interested to find out what words other languages translate into English and if there are any cultural differences. 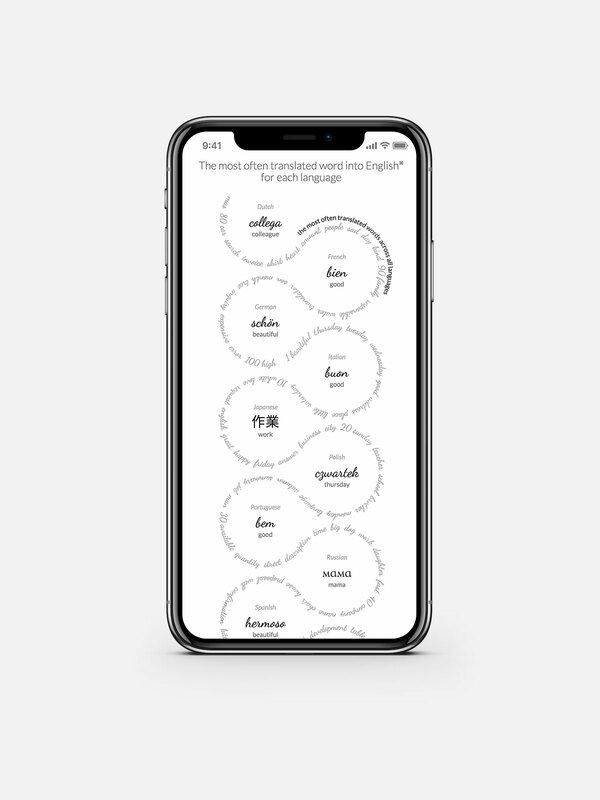 I worked together with Google News Lab and the Google Translate team to get a dataset of the top 500 single word translations into English from 10 chosen languages . It still required data preparation from my end to clean up these words since I was only interested in the nouns and adjectives. I focused on creating a page that would have a top-down approach. Starting with the most common noun or adjective at the top, which happened to be beautiful, a very happy coincidence. Next it goes into more detail the further you scroll down. 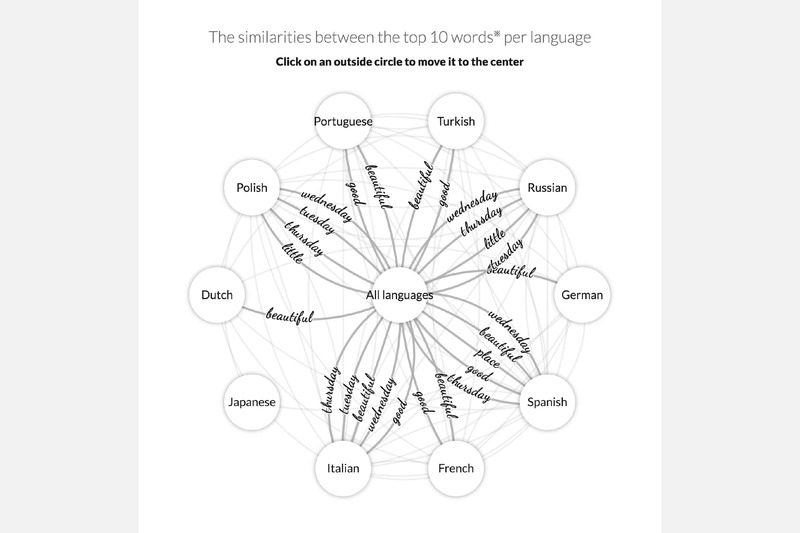 From the most translated word per language, to the top 10 per language and finally to the similarities between languages. 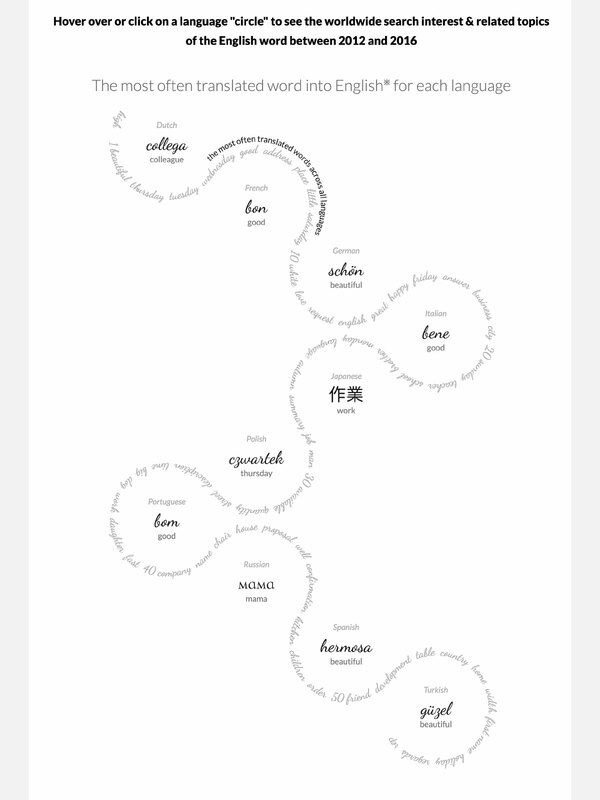 For each of these three sections I created a visualization that was heavily, or completely, build up of words themselves, fitting the topic of translations. The entire page was made to be both mobile and desktop friendly, with the visualizations being recalculated to either fit a wide or narrow layout, instead of merely resizing. Thereby making optimum use of the rectangular and small screens of mobiles. You can read more about the data, design & coding process on the data sketches write-up.